"Ruth always told me that she wanted to turn her suffering into something good for someone else,’”says Howard Joseph, widower to the late Ruth Bradley. Ruth’s altruism extended throughout many areas of her life. As an animal behaviorist, she cared for several foster pets on her and Howard’s Wisconsin tree farm. As a patient who lived with systemic lupus erythematosus (SLE), mixed connective tissue disease and rheumatoid arthritis for more than 35 years, Ruth also looked for ways to help others with rheumatic diseases. She and Howard talked about writing a book to provide information and lessons learned from her experience. 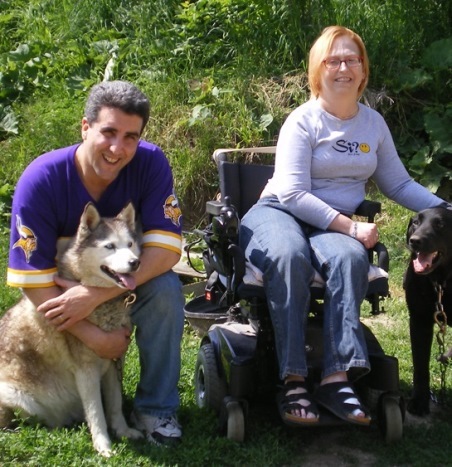 Sadly, Ruth died of complications from lupus on February 24, 2011, at the age of 41. Ruth’s passing encouraged Howard to carry forth her legacy, but it also gave him a new angle in his mission to help other patients. Now one of his biggest hopes for the future is a rheumatologist in every hospital and a better understanding of rheumatology among all medical professionals. Until 2010, Ruth always had access to outstanding rheumatologists. While living in Wisconsin, she was under the care of Timothy Buckley, DO, who Howard describes as phenomenal. “One day, Dr. Buckley even personally called me to update me on Ruth’s health. No other doctor has ever done that before. I was really impressed,” says Howard. In April of 2010, Ruth and Howard moved from Wisconsin to Arizona, where they would no longer be able to see Dr. Buckley. Upon their arrival, they immediately tried to find a new rheumatologist, but the earliest available appointment was nearly six months away, so Ruth and Howard sought treatment from a general physician. They used Ruth’s past medications as a guide, but when complications arose, Howard realized just how important a rheumatologist’s care can be. A few weeks before Ruth’s first scheduled rheumatologist appointment, she was hospitalized with pneumonia. Howard once again tried to get her in to see a rheumatologist, but the hospital did not have a rheumatologist on staff. Ruth spent the next months between hospital and nursing home, unable to see a rheumatologist at either. Her lupus and joint pain grew worse, and Howard says that the general physicians at the nursing home and hospital eventually turned to him for advice on how to manage Ruth’s lupus. “I’m certainly not a rheumatologist. But based on what I had learned from caring for Ruth for almost 10 years, I recommended that they put her back on a treatment that had been effective in Wisconsin.” Howard says that the medication left her more susceptible to pneumonia, which he believes ultimately led to her passing. After going through this experience, Howard is now passionate about educating others on the importance of rheumatologists. With that mission in mind, he learned about the Rheumatology Research Foundation and its efforts to recruit and train the next generation of rheumatology health professionals.